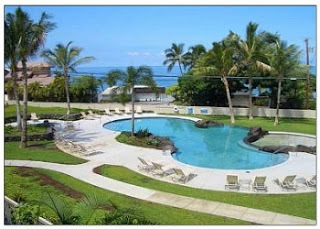 Luxury appointed extra large townhouse style condominium with ocean view. Over 2130 square feet! Walking distance to ocean, shops, restaurants, and night life. Largest floor-plan available. Includes private garage with enough room for your car and beach toys. 47 inch LED bright TV with wireless internet, Facebook, Twitter, etc. internet apps. ,X-Box DVD and cable. Hawaiiana style furnishings, wall art, Cal King 4 poster bed in master bedroom with double vanities, office includes desktop computer monitor and printer and sleeper sofa. Sleeps 6 privately. Walk across the street to Honl's beach hit the surf, or lounge by the pool and hot-tub. Pool clubhouse has fitness center and BBQ grills. Must see this gem! Call for this or any other rental in Kona. Sqft area includes approx. 467 sqft of lanai area. Cable, wireless internet, computer, and printer are included. Tax and electric are extra. Deposit required. Cleaning fee is $250.00, or you may hire your own cleaner. This property has a minimum rental term of 30 days. Additional days above 30 are pro-rated to the day based on a 30 day month.